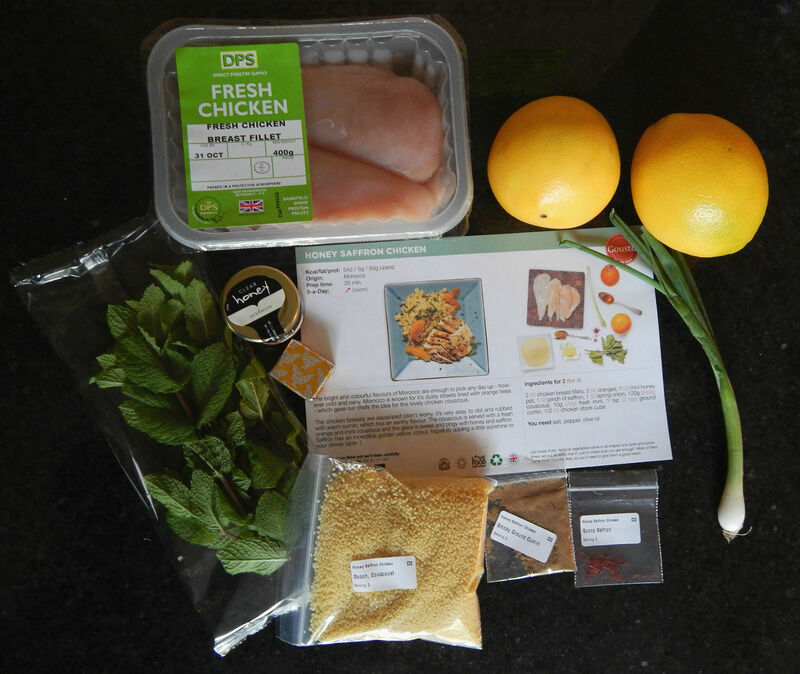 Lately I have been cooking with the wonderful people from Gousto. 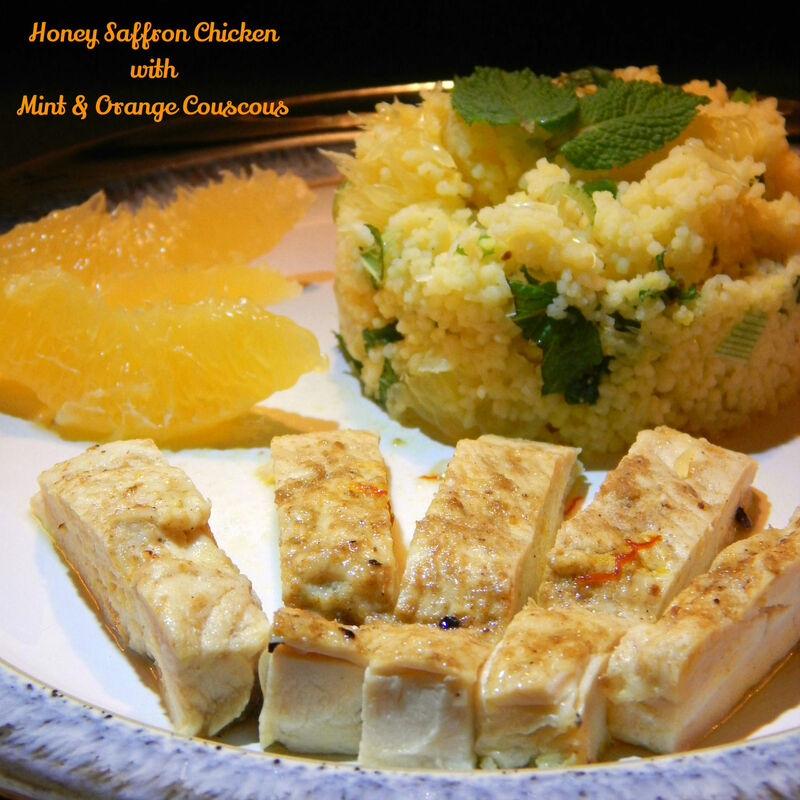 Today I would like to share with you their recipe for Honey Saffron Chicken with Mint & Orange Couscous. Yes you may start drooling…. This is a truly delightful dish bursting with flavours from the earthy cumin to the bright zing of the orange in the couscous (a new discovery for us, but from now it will be a regular feature as couscous goes so well with the orange!). 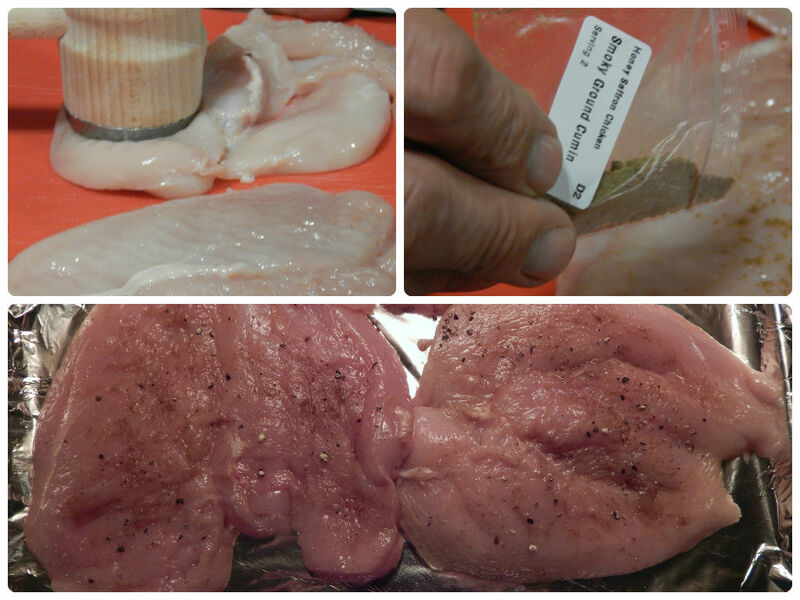 Butterfly the chicken breast and lay out flat on a worktop board. Cover with some cling film and then with a rolling pin or meat tenderiser flatten out the chicken till it is around 1cm thick at most. Sprinkle over the cumin and drizzle with some olive oil and massage into the chicken. Add salt and pepper to taste and place in a roasting tray and pop into the oven for 10-15 minutes until cooked. Boil a kettle and measure out 200ml of water. Use this water to dissolve half of the chicken stock cube and then add it into your couscous, give it a quick stir, then cover and set aside for a good 10 minutes. Now for the fiddly part, take your oranges and cut of the top and bottom so they can stand up straight. Cut the skin into sections from top to bottom to help with peeling. Once you have skinned the oranges you now need to remove all the pith. There are two reasons for this, firstly the pith is bitter and so we don’t want it spoiling our dinner and secondly we need to see the segments of the orange for the next step. With the sharpest knife you own cut the oranges on either side of the membrane of each orange segment. This is best done over a large bowl so you can collect all the juice drops, we will need them later. Remove all the segments and set aside, throw away the core. 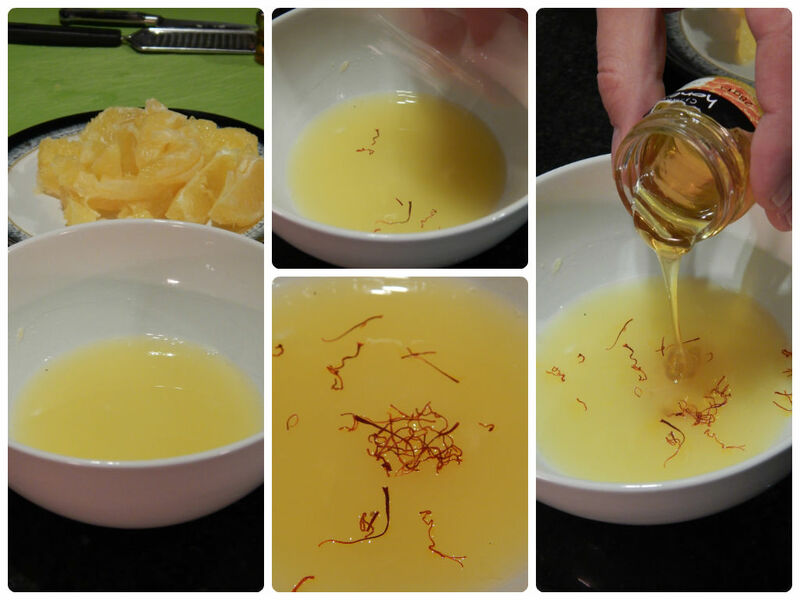 Add the honey and the saffron to the orange juice and give a good stir to help release the colour and flavour from the saffron as well as mixing in the honey. If your chicken is finished then remove from the oven and let rest for a few minutes. 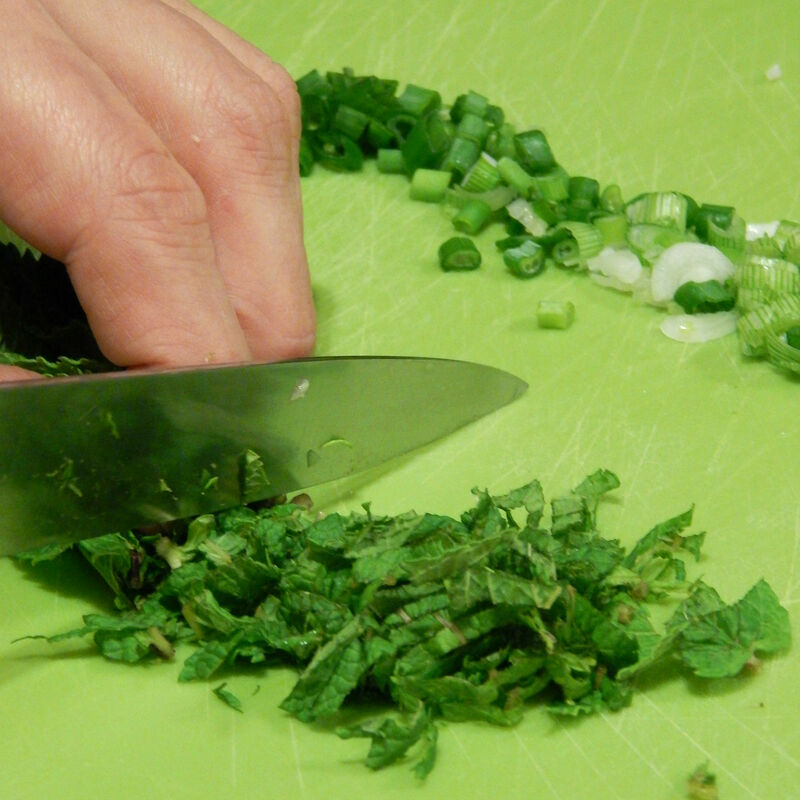 Fine chop your mint and spring onion and set aside. 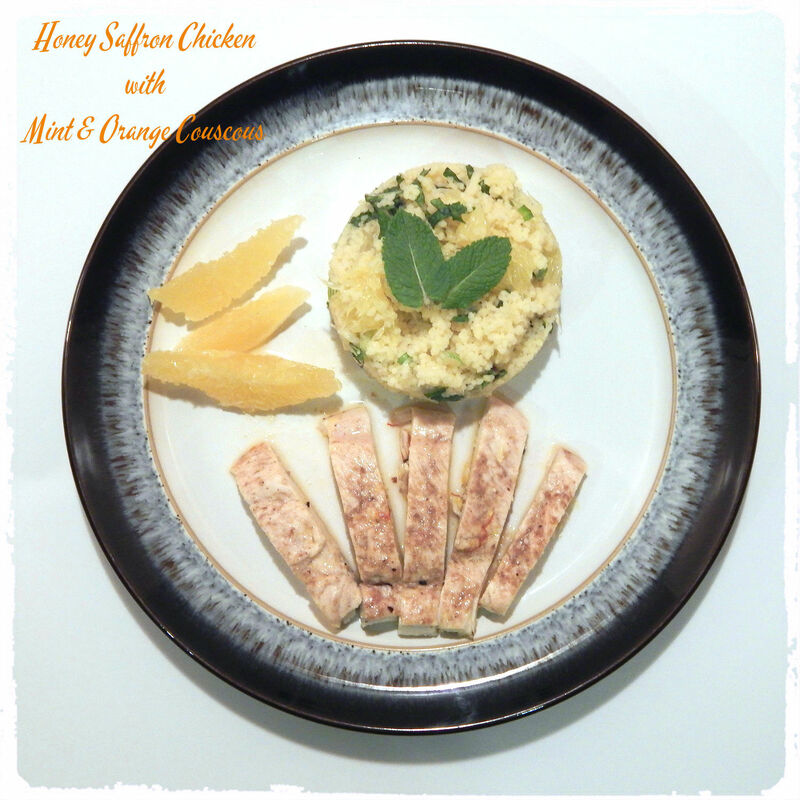 Cut you chicken into slices and coat with half of the orange-honey-saffron dressing. Add the orange segments, mint, spring onion and the remaining saffron dressing to the couscous and mix well; then fluff up with a fork. 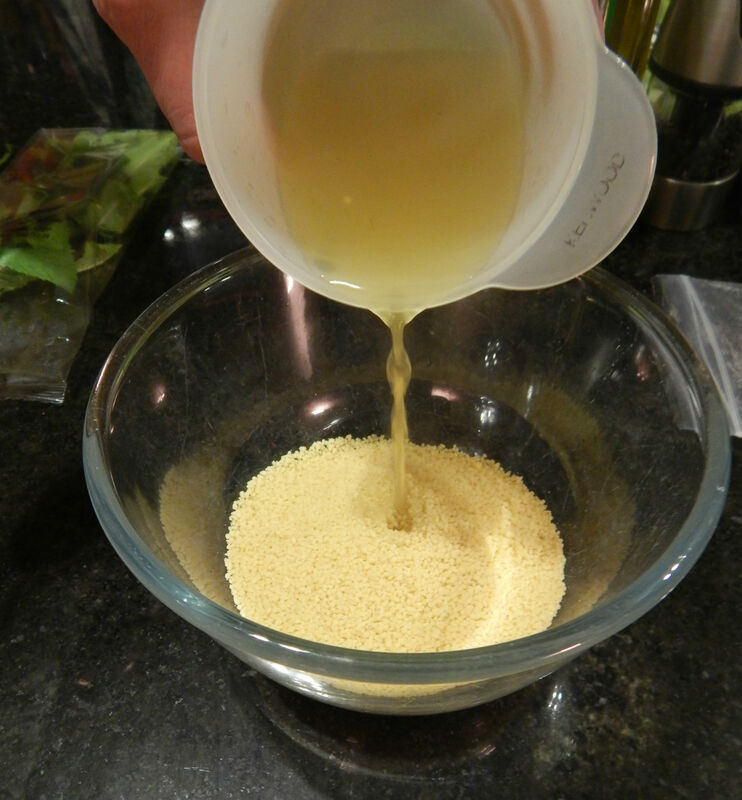 If you would like you can dress the couscous with a drizzle of olive oil and then season to taste. To serve just lay the chicken to the side of the couscous salad. This looks like a nice recipe. We don’t eat cous cous nearly enough. Lovely recipe and it looks healthy too. Yummy scrummy! Saffron is my all-time favourtie. Pinning and going to try really soon. Delicious. It’s always great to add a new chicken dish to our repertoire. I love the sound of the orange and honey. 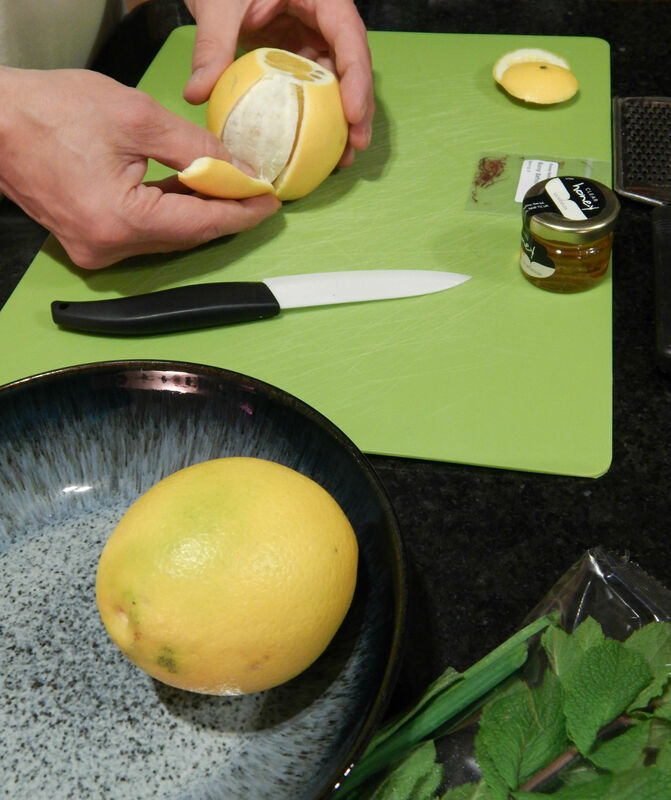 We often use lemon, lime or orange zest in our couscous and rice. With the rice you just need to par-boil it, then drain, throw in the zest, some fried off onions and a few spices and a tiny bit of water – just enough to steam the rice to fully cooked over a low heat with the lid on tight. Thank you Aisha. From now on we will be adding more fruits to our couscous. This looks lovely. I am a huge fan of cous cous but usually eat it on it’s own. It sounds lovely, but I am not a fan of cous cous sadly. This looks amazing! Will definitely be trying this out, thanks for sharing! Mmmmm this sounds amazing! I only ever order couscous from restaurants as I’m useless at making it taste of anything! 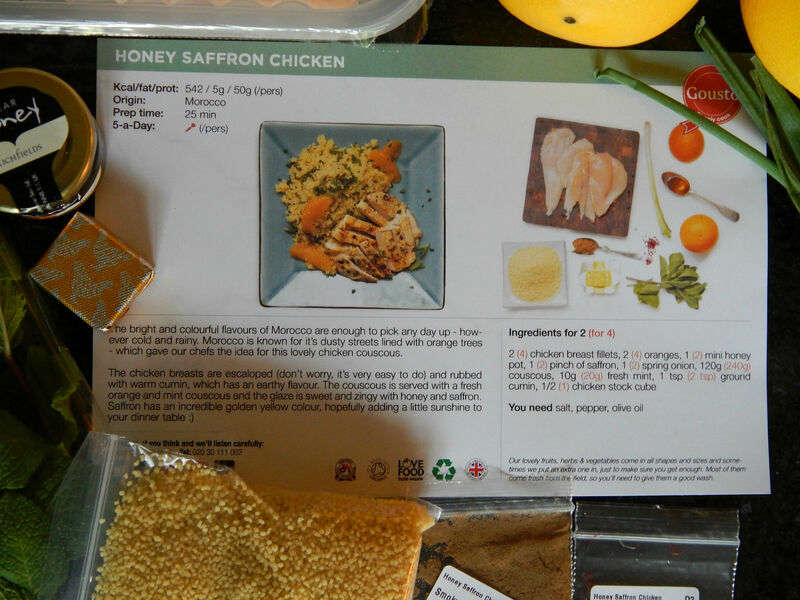 The cous cous sounds yummy, as a veggie I cant have the chicken but I could try the same flavours with quorn. I love Moroccan food so this sounds brilliant. The cous cous in particular is one I need to try.